1. Wash the chives, and allow them to dry in the air. 2. Peel off the water chestnuts' skin. 3. 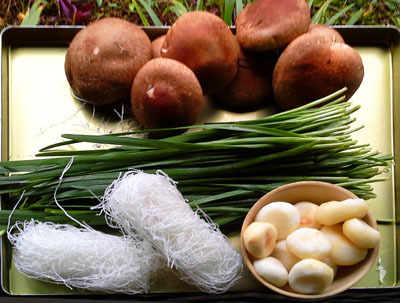 Soak the dry glass noodles in just boiled water for about 5 minutes, then drain away the water. 1. 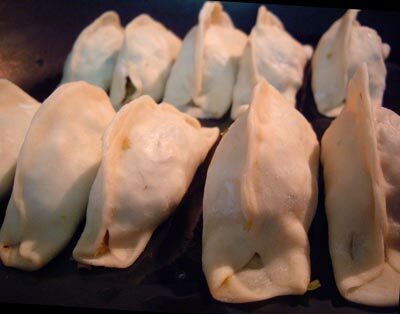 To make the pocket non-vegetarian: After the basic filling is prepared, you can add any the following ingredients and mix well: raw meat balls (mashed), minced pork, fresh chopped shrimp. Turn the heat low, and oil the frying pan. Put the dumplings side-by-side in the pan (without leaving space between each one). Mix 1 teaspoon of flour into a cup of water and pour it into the pan (the water should be about half the height of the dumplings). Turn the heat high. Put a lid on the pan. The dumplings are cooked when there is no more water in the pan. 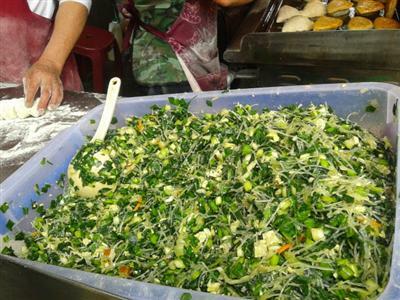 Serve the dumplings upside down. Place the oven paper in the bamboo steamer. Put the dumplings side-by-side in the bamboo steamer. Put the bamboo steamer in a wok which is big enough to hold it. Put some water into the wok. The water should be touching the bottom 1cm (half inch) of the steamer. (and always use at least enough water to ensure it won't boil dry). Steam at high heat for 10 minutes. Put 2 liters of water in a pot or saucepan, bring to the boil. And put 10 dumplings into the boiling water. 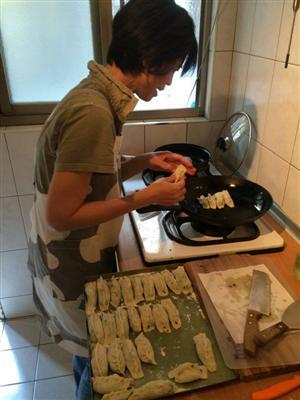 The dumplings should sink to the bottom. Cook until they are floating near the top of the water.